Granola is one of those foods that I could easily eat quite a lot of, though I tend to not eat it as a cereal but add it to dishes. I love the crunchiness and the variety it gives to transform your simple fruit and yoghurt into something more exciting. However granola is usually high in sugars and the amount of fruit, nuts and seeds is surprisingly low. If you have the time you could of course make your own, but you have to watch it carefully when it bakes. With my current tribe of small people I would be sure to burn it! So I was most delighted to be sent a pack of granola to try out, especially when it was chocolate granola. Such a hard life. Lizi’s granola is something I’ve recommended to some clients in the past due to it’s low sugar content and low glycaemic load (GL). The GL is a measure of how much a portion of a food affects your blood sugars. The GL for this granola is 6.6 for a 50g serving. Generally a low GL foods is one under 10 and you want to keep your GL to under 100 per day. So this granola is definitely a good option if you want a not too sweet, crunchy hit with a chocolately taste. It uses dark chocolate (which I love), some may say there is the added benefit of polyphenols and antioxidants but at only 5% dark belgium chocolate you won’t be getting much per 50g serving. 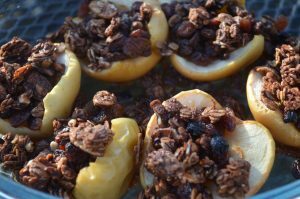 Here is how we enjoyed the granola – baked apples with chocolate granola. Instantly renamed big gruffalo crumble by the toddler boy. He calls any fruit crumble a gruffalo crumble, completely my fault for starting that one. A quick, simple dessert that is great to perk up your midweek meals. Cut the apples in half and cut out the core, this will leave a hole you can now fill. Fill the apples with the raisins, dot with a little butter and press the granola over the top. Serve with Greek yoghurt if wanted. Disclaimer: This granola was sent to me to review, this is not a dietetic endorsment but simply my own views on it. Evenings. They can be those times when you just fancy a sweet treat. Perhaps it’s been a tough day, perhaps it’s the fact the kids are in bed and you have time to yourself, perhaps you’ve been working out and need a snack. You know the feeling. This also makes an ideal pudding – great for family mealtimes. Cut the core out of the apple – I place it on a chopping board and hack with a knife, but use an apple corer if you have one. Fill the centre with rasins, cinnamon and whatever else you fancy. 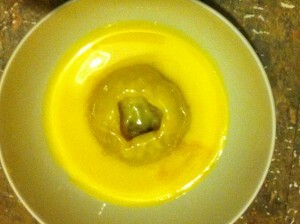 Top with custard and reheat then EAT. 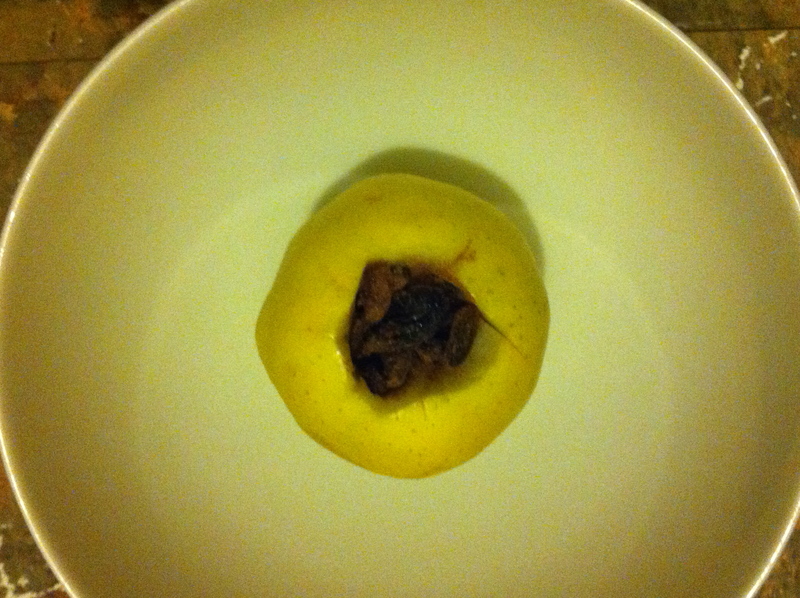 Dietitian UK: Baked Apple – stuff it with raisins then microwave Dietitian UK: Baked Apple with raisins and custard. Contains 1-2 portions of fruit, fibre and calcium from the custard.